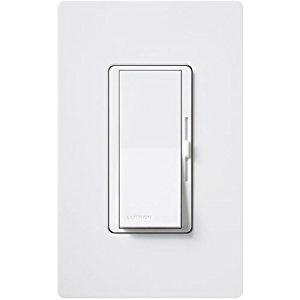 Lutron Diva® Electronic low-voltage preset dimmer in white color, features paddle actuator that allows to control the brightness of the light. It has voltage rating of 120-Volts at 60-Hz. This 1-Pole dimmer in gloss finish, has maximum load capacity of 300-Watts. It measures 4.69-Inch x 2.94-Inch x 0.3-Inch. Paddle in the dimmer turns ON/OFF the light. It has slider that brightens the light when moved up and dims when moved down. It complements existing designer-style switches. It has built-in soft glow locator light that illuminates when the dimmer is in the OFF position. Dimmer is UL listed, CSA and NOM certified. * Inventory displayed is accurate as of 04/19/2019 07:40 EDT.